Basically, this has replaced Burt's Bees in my book as the best lip balm ever. It's soft, feels nice, lasts for a decent amount of time, is easy to use, smells good, and has an unbeatable price. You will definitely not regret trying it out, and will end up a convert like me! Soft, goes on easy, clear, tasteless, lightly scented, feels good, lasts hours. Germ contamination possible due to design. 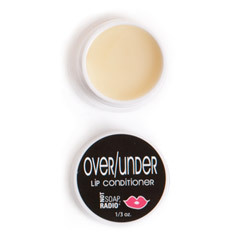 Thank you for viewing Over under lip conditioner page!